The self-paced Slow and Obsolete Spare Parts Management Training Course teaches you how to manage slow and obsolete inventory. The course provides you with a general understanding of spare parts inventory management, then teaches you how to determine the most appropriate stock holding level, and then uses that information to help you address physical storeroom management and the management of slow and obsolete inventory (SLOBs). The issues and potential responses for managing slow moving inventory. The difference between vendor-led and owner-led obsolescence and the implications of each. How to develop an End-Of-Life (EOL) plan and calculate Last-Time-Buy requirements. How to recognize the issues involved in managing spare parts disposal and how to pro-actively manage spare parts obsolescence and disposal. The 7 different disposal options and the benefits of each. The pros and cons of storeroom location decisions. The physical issues of storeroom management, including layout, storage issues, labelling, and work flow. Understand how to manage rotable and repairable spares. The Slow and Obsolete Spare Parts Management Training Course is for those people who are specifically interested in dealing with the issue of managing slow and obsolete inventory. Each module includes an online quiz. 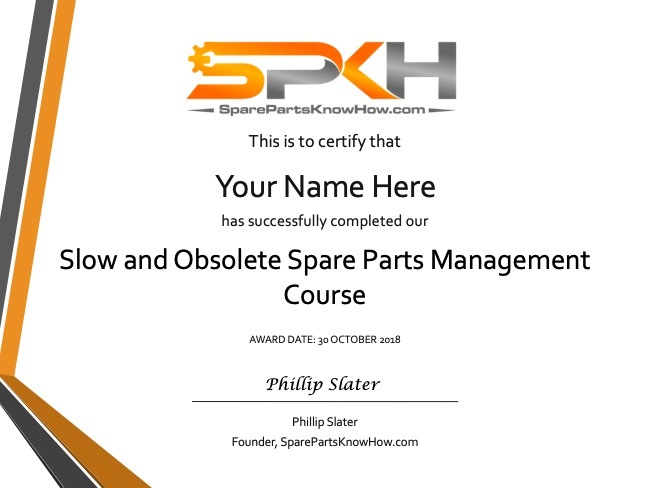 Successfully completing all four of the online quizzes leads to the award of our Slow and Obsolete Spare Parts Management Course certificate. We set the ‘pass’ level for these quizzes at 80%.